THE tripling of Spain’s Lynx cat population following a successful captive breeding program might see them reintroduced to the UK. ct saw the Iberian Lynx, which was confined to less than 100 in the Andalucian region, increase in population size despite having only 25 breeding females. 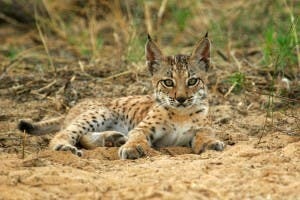 A decline in habitat space and rabbit population (the wild cat’s main food source) led the Spanish Environment Ministry and Andalusian Environment Council to agree on a breeding programme where cats were born in captivity and gradually released (400 by 2015). Most of the cats remain in Andalucia and stay in a territorial area of 20 square kilometers, but some have reached the hills near Toledo, Extremadura. Following the project’s success, the Lynx UK Trust has been established to reintroduce the medium-sized cats to the British Isles, where they have not roamed for 1,000 years. The species would be the Eurasian Lynx as opposed to Iberian, which are larger with small tufts of black hair on each ear. The UK government is set to discuss the issue later this year, but farmers have voiced opposition over fears for their animals’ safety.